If your restaurant plate is garnished with an herb, it’s probably parsley. This herb is widely used and prized not only for it’s added flavor, but also for it’s health benefits. Once you understand medicinal and nutritional parsley health benefits, you won’t only eat your garnish, you may want to grow your own! And growing parsley is easy! Parsley wasn’t always so well-liked. As a matter of fact, the herb was known to strike people with fear. According to Dr. May Berenbaum, head of the University of Illinois Entomology Department, it was associated with death and the devil. The Greeks said the herb first grew in the blood of a fertility king, Archemorus (forerunner of death). As a result, it was laid on their tombs and when someone was said to “need only parsley”, it meant they were near death. The herb was so feared by the Greeks that an ancient Celt sent donkeys onto the battlefield adorned with parsley, and the Greek troops turned and fled. Virgins who planted the herb were said to risk impregnation by the devil himself. The only planting of parsley was done on Good Friday. Any other day meant the gardener would risk certain curse. Parsley is also a great source of vitamin C and beta-carotene (pro-vitamin A). Some people put parsley on as high of a pedestal as kale in regards to health benefits. Just 1 tablespoon of parsley contains 61.5 micrograms of vitamin K (77% RDA), 5 milligrams of vitamin C (8% RDA), and 316 IUs of vitamin A (6% RDA). While you could wait until you get a little spring on your dinner plate, you’ll get far more benefits of this healing herb if you simply grow it yourself. Like basil (sweet basil and holy basil), mint, and oregano, growing parsley is relatively easy. All it needs is some water, sunlight, good soil, and tender-loving care. The best way to use parsley is when it’s fresh. It can be dried or frozen but loses much of its flavor that way. The easiest way to receive parsley health benefits is by simply eating it. This is especially true for digestive ailments or bad breath. Simply chew on a few sprigs of parsley and you should see quick benefits. Parsley is usually used as a decorative accent to a scrumptious meal, but don't set it aside just yet. In a new study, a University of Missouri researcher has found that a compound in parsley and other plant products, including fruits and nuts, can stop certain breast cancer tumor cells from multiplying and growing. The study was published recently in Cancer Prevention Research. but don't set it aside just yet. In his study, Salman Hyder, the Zalk Endowed Professor in Tumor Angiogenesis and professor of biomedical sciences in the College of Veterinary Medicine and the Dalton Cardiovascular Research Center, exposed rats with a certain type of breast cancer to apigenin, a common compound found in parsley and other plant products. Hyder believes this finding could impact women who are taking certain hormone replacement therapies. "Six to 10 million women in the United States receive hormone replacement therapy (HRT)," Hyder said. "We know that certain synthetic hormones used in HRT accelerate breast tumor development. In our study, we exposed the rats to one of the chemicals used in the most common HRTs received in the United States - a progestin called medroxyprogesterone acetate (MPA) - which also happens to be the same synthetic hormone that accelerates breast tumor development." When tumor cells develop in the breast in response to MPA, they encourage new blood vessels to form within tumors. The blood vessels then supply needed nutrients for the tumors to grow and multiply. Hyder found that apigenin blocked new blood vessel formation, thereby delaying, and sometimes stopping, the development of the tumors. Hyder also found that the compound reduced the overall number of tumors. However, while apigenin did delay tumor growth, it did not stop the initial formation of cancer cells within the breast. However, apigenin is not absorbed efficiently into the bloodstream, so scientists are unsure of how much can or should be ingested. "We don't have specific dosage for humans yet," Hyder said. "However, it appears that keeping a minimal level of apigenin in the bloodstream is important to delay the onset of breast cancer that progresses in response to progestins such as MPA. It's probably a good idea to eat a little parsley and some fruit every day to ensure the minimal amount. However, you can also find this compound in pill supplements in the health food section of many stores. Of course, you should always check with your doctor before making any major changes to your diet or lifestyle." Parsley has been revered throughout history and used for both culinary and medicinal purposes. The Greeks made crowns of parsley to bestow upon their sports champions. It was used for the Hebrew celebration of Passover as a sign of rebirth in the spring. The Romans used it to deodorize corpses before funerals. It contains a unique combination of nutrients that make it a powerful superfood. The volatile oil compounds myristicin, limonene, eugenol, and alpha-thujene have been shown to inhibit tumor cell formation. Additionally, parsley is rich in flavonoids-including apiin, apigenin, crisoeriol, and luteolin that have strong anti-oxidant properties. Parsley also contains about three times the amount of vitamin C by volume as an orange. Vitamin C is extremely important for healthy immune function and youthful skin & joints. And, it contains carotenoid anti-oxidants lutein and zeaxanthin which enhance eye function and help the body neutralize damage from UV radiation. Parsley is super rich in chlorophyll, the energy producing substance that gives herbs and plants its characteristic green color. Chlorophyll helps to alkalize the body, purify blood, and form new red blood cells. 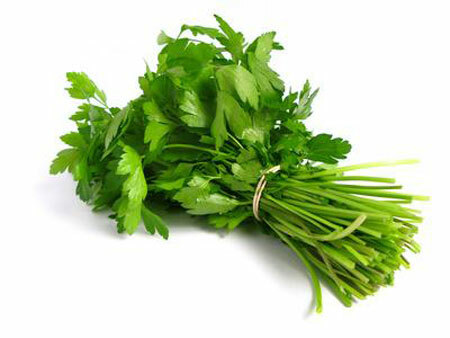 In addition, the chlorophyll and flavonoids in parsley help to enhance cellular glutathione formation. Higher levels of cellular glutathione allow the body to detoxify and heal more effectively. Parsley is also known as a powerful diuretic that reduces blood pressure and enhances kidney function. In particular, parsley increases sodium and water excretion thru urine and increases potassium reabsorption into the kidneys. This is particularly useful for anyone with poor circulation, swelling, cellulite, and other cardiovascular problems. 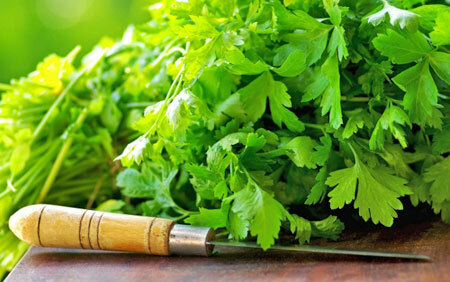 Parsley dipped in apple cider vinegar is especially useful for reducing body odor and improving digestive function. The natural acids, chlorophyll and enzymes present in this food combination synergize to enhance the intestinal microflora. This is one of the best aids for neutralizing acid reflux, gas and bloating. Parsley, that little piece of leafy green garnish that seems to decorate every plate in restaurants all across the U.S., is actually a serious herb which packs a powerful punch. "Are we supposed to eat it?" If it is certified organic parsley, then the answer is "yes." Parsley leaf is loaded with antioxidants and is a fantastic diuretic. The herb is a wonderful kidney aid, helping to get rid of kidney stones and edema (swelling), as well as healing any urinary tract infection or inflammation. Parsley root is high in calcium, iron, and B complex vitamins. The British Journal of Nutrition published a medical study to measure the antioxidant capabilities of parsley (Petroselinum crispum). Fourteen people ate a restricted diet for two weeks which was high in parsley, but low in other foods containing flavones and other natural sources of antioxidants. Urinary excretion of the flavone apigenin was measured before and during the ingestion of parsley. Apigenin levels were noticeably higher when parsley was added to the diet. The researchers noted that when the subjects were on the restricted diet, their oxidative stress markers rose. However, when the people added parsley during the second week of study, the parsley was able to reverse these numbers somewhat. In 2002, the Journal of Ethnopharmacology published a study confirming the diuretic effects of parsley, as claimed for years in folk medicine literature. Rats were given parsley seed tea to drink. Over a twenty-four hour period, the rats had a marked increase in urinary volume. The scientists believed that parsley works as a diuretic due to a mechanism in the herb which blocks the re-absorption of sodium and potassium. This causes more water to flow via osmosis, and hence, a greater urinary volume. Dr. Christopher used parsley for water retention (edema), and suggested parsley root tea for stiff fingers and other joint issues. He said gallstones could be removed by drinking a pint of fresh parsley tea every day. The herb is also calming to the nerves and adrenal glands. Dr. Christopher recommended at least two quarts of strong parsley tea per day for these issues, or even up to a cup of tea every hour. To make fresh parsley tea, add a large handful of parsley to a pint of boiling water. Cover, steep, and drink the tea throughout the day. According to Dr. Christopher, fresh parsley juice is a very potent healer. Parsley juice is an effective blood tonic, but it should be diluted with some other kind of fresh, organic juice, such as carrot juice. No more than an ounce or two of parsley juice should be taken at any one time. Pubmed.gov. "Effect of parsley (Petroselinum crispum) intake on urinary apigenin excretion, blood antioxidant enzymes and bio-markers for oxidative stress in human subjects," S.E. Nielsen, et al. British Journal of Nutrition June 1999; 81(6): 447-55.